In 1988, Salman Rushdie shocked the Muslim world when his book, The Satanic Verses, was published. Though he is of Indian descent, Rushdie was a well-renowned English novelist — which is why the novel hit Muslims in England particularly hard. In their country, the book received positive reviews and was even awarded the 1988 Whitbread Award for novel of the year. As a work of magical realism, many praised the novel for capturing the struggles of the immigrant experience as well as the author’s own identity crisis as a migrant. While Rushdie confirmed these interpretations, saying the novel was about “about migration, metamorphosis, divided selves, love, death, London and Bombay” (Wikipedia), many in the Muslim community interpreted the novel as blasphemous. Indeed, The Satanic Verses seemed to be like a transformed narration of Muhammad’s life in Mecca, and many Muslims viewed its handling of Islam, the Prophet and the Prophet’s family as insulting and “thus placed it within a long tradition of anti-Islamic writings in the West” (69). The book sparked riots and protests throughout the Muslim world. There was outrage in Pakistan, and the Indian government even banned the sale of the book. Demonstrations that involved “ritual burnings” of the book occurred in Bradford. But the greatest reaction came from Ayatollah Rouhullah Khomeini who issued a fatwa on Salman Rushdie — thus pronouncing him an apostate and making it acceptable for Muslims to kill him. The Rushdie affair, as it is now known, created a tense conflict between religious respect and freedom of speech. Many Muslim modernists were put in a difficult place, like Akbar Ahmad, who “strongly opposed the theme of the book,” yet “supported Rushdie’s right to have written it” (70). While The Satanic Verses spurred chaos and conflict, the controversy of the book did ultimately help bring Muslims into the foreground of politics and a huge political debate. As John Rex put it, the Rushdie affair “was a watershed in the evolution of Britain’s Muslim community in that it made Muslims realize the importance of becoming politically better organized” (70). What sets Muslims in the U.K. apart from other Muslims in Europe is this involvement in politics. Britain is unique from European countries in that U.K. residents from Ireland or Commonwealth nations can attain full citizenship through a simple registration process — and the overwhelming majority of Muslims in the U.K. are from Commonwealth nations. So the focus of Muslims political participation in the U.K. will be on Asian immigrants. According to John Rex, Asians are more likely to register to vote than whites, they are more likely to vote than whites, and they participate actively in local politics and local political parties — with Muslims among the most active of these immigrants (66). However, Muslims in the U.K. still struggle with social assimilation. In his chapter “Islam in the United Kingdom,” John Rex poses a weighted question: “How can Muslims be expected to fit into existing British society and to what extent can they contribute to the development of an ideal multicultural society?” (71). The problem with assimilation is that it compromises the culture of an immigrant — something they don’t want, and shouldn’t have, to lose. The poorer working class communities of Muslim immigrants often form their own islands within the country — finding their “primary foci of belonging” (65) in their own mosque-based communities, like Bradford, Birmingham or Rochdale. The influence of Western experiences on Muslims can be contradictory, where it brings both more moderates as well as more militant conservatives. For example, in Malaysia, the influence of the American experience led to the reformist shift of the Islamic Youth Movement of Malaysia (ABIM), whereas the influence of the British experience had the opposite effect on members of Malaysia’s Pan-Islamic Part (PAS) (249). 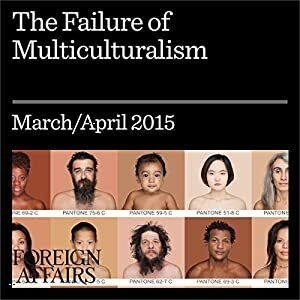 There are other inadequacies with multiculturalism — as Kenan Malik highlighted in “The Failure of Multiculturalism,” published in Foreign Affairs. Malik pointed out that the debate between multiculturalism and assimilationist was largely null. Neither are effective policies. Malik suggested that “an ideal policy would marry multiculturalism’s embrace of actual diversity, rather than its tendency to institutionalize differences, and assimilationist’s resolve to treat everyone as citizens, rather than its tendency to construct a national identity by characterizing certain groups as alien to the nation.” In fact, this response in itself mirrors the way integration should be approached for all immigrants — not one culture over the other but a melding of the best parts of both. A struggle unique to Muslim youth in Europe is the feeling of being torn between the culture of their parents and the culture of the West. While they were strongly influenced by their parent’s ideals during childhood, they also struggled with the need to fit in with their peers at school. This has created a spectrum which the Muslim youth of today fall on. On one end we have a group of young people who try as hard as they can to become completely “Westernized.” They don’t associate with their religion nearly as much as their parents and are attempting to completely embrace the culture of the West. On the other hand, we have young Muslims who try to integrate Islam into their everyday lives as much as possible. They seek a “return” to Islam. Not only must Muslim youth find their identity within European culture, they must also try to find their identity along the spectrum within themselves. Muslim youths also struggle, like their immigrant parents, with discrimination and a feeling of “otherness” in Western society. Anti-Muslim sentiment is still pervasive across Europe. But what makes their particular struggle unique is the culture of information dissemination we live in today. They can encounter hate speech and cruelty across several platforms on the Internet, from social media to online news sources. Young Muslims also struggle with what Islam means today, whether they are strict practitioners of their religion or not. They encounter complex debates about what Islam means to them, to Westerners and to the rest of the world. They are also in the midst of a change in Islam, due to the fast spread of information across the Internet. Islam, like all religions, changes and shifts as each generation contributes their thoughts and ideals to what Islam means to the world. One dynamic that will determine interactions between Europe’s Muslim communities and society overall is the gradual trend of Muslims in Europe acting as a cohesive group. Despite their considerable presence in Europe, they are underrepresented in the EU, in the European Parliament and other international organizations. Acting as a unified cohesive group will mean that Muslims may begin to demand more representation in groups like these to make sure their rights are being heard and respected. Another dynamic is the acts of radical extremists such as ISIS and Boko Haram. While the type of “Islam” these groups believe in is almost unrecognizable from what the religion of Islam actually means to its millions of followers around the world, the acts of terrorism by these groups has influenced the way the world views Islam. Subsequently, it has influenced the way Muslims and the rest of the world interact. Oftentimes, people of the West react with hostility and fear out of ignorance. This has contributed to a rise in discrimination and “Islamophobia” in cultures that don’t understand Islam and make snap judgments when they read the news. In foreign policy matters however, these groups have little impact beyond efforts to eliminate the root causes of extremism in the Muslim world. I agree with Göle’s assertion that a “remapping” of the world is underway. Globalization has been a driving factor in this reshaping of the world and borders are not necessarily what they used to be. The widespread distribution of technologies such as mobile phones and the internet has reached everyone from the very rich to the desperately poor in some shape or form. The supremacy of the “first world” as Göle discusses is a reference to the global world powers such as the U.S., China and Russia as major economic hubs. As we have learned in the 3510 class, globalization is an uneven process that results in the unsettling of the world powers. This process poses obstacles to lesser developed countries and the citizens that live there. In this post I will further examine obstacles to Muslim societies in Europe. To begin, I researched a few statistics on Muslim populations from Pew Research to gain a better understanding of the situation in each country. The article lists 5 facts that I believe are important when discussing Islam in Europe. France and Germany have the highest Muslim populations in the E.U. These statistics are important to keep in mind when discussing Islam in light of the recent ISIS attacks in Europe. The history of rising Muslim populations and the rise of ISIS ideals has heightened the anti-muslim language present throughout European airwaves right now. I believe many of the underspoken feelings and stereotypes are being voiced as anti-muslim, which is completely unfair and unjust. Gole did a good job of explaining how globalization and the destruction of borders has affected the mindset of Europeans. The more Europe becomes a place of cultural heterogeneity, the more Europeans express their fear of losing their purity, of seeing their heritage erased, of feeling threatened by the presence and difference of immigrants,”(Gole 17). There are complicit internal aspects to this ordeal that will need to be resolved by each nation and the E.U as a whole. It would be foolish to say Europe has flawlessly assimilated Muslims and others into their societies. As we discussed in class and in the readings, countries such as France and Switzerland have contributed to the issue by passing laws discriminating against Muslims. This BBC article discussed the 2014 ruling in which the European Court for Human Rights upheld a French ban on wearing the full-face Muslim veil, known as the niqab. Rulings like these further skew public perceptions into discriminative tones against Muslims. The public visibility of religious symbols of Islam should not be a factor that is debated in courts or anywhere else for that matter. The right to religious freedom should be protected in every country and not subject to debate or political action. It’s sad to see groups such as ISIS, Al Qaeda and Boko Haram case widespread fear in the name of Islam. There are countless obstacles to overcome for Muslims in Europe, but these initial questions must be answered first and foremost. Where/how will each European nation take on the sheer number of migrants? What will be done to integrate them into society? How will ISIS continue to influence policy there? The large-scale migration of Muslims to Germany occurred in the 1950s, post-World War II, with high economic growth and a shortage of labor. However, Muslims faced many challenges integrating into the country. Most of the Muslim immigrants were single men from rural areas and had already gone through an “internal immigration” transitioning to urban cities (30). They also viewed their stay as temporary — both the immigrants and the receiving society — and therefore didn’t make an effort to integrate or interact fully. But as time went on, it became clear that they could not make a large sum of money in a short period of time. While the idea of Muslim immigrants as “guest workers” persisted, the Muslim men in the country were encouraging their families to come join them, and a mass “family reunification” (31) for immigrants in Germany was underway. A second wave of Muslim immigration occurred in the mid-1970s, and Islam quickly became the second largest religion in the country, behind Christianity. And with that, more problems stemmed. There was a certain “incompatibility of Muslims with Germany’s Christian culture.” The more secular Christians developed resentments for the Muslim community, associating “Islam with religious fundamentalism and political extremism” (29). The total number of Muslim immigrants in Germany was close to 3.3 million, with Turkish Muslims making up the majority, around 75 percent. German Muslims have dealt with a lot of discrimination. They are not recognized as a legal public body because there is no single official Muslim institution that can recognize all Muslims (44). Therefore, they are often not given a voice. German laws contradict some of the Muslim rituals, such as the requirement to eat only halal meat and the religious requirements for burials. Prayer five times a day and women’s headscarves also create tension within schools and the workplace. Certain communities do not allow mosques with a minaret, and there have been local initiatives against the construction of mosques all together (45). Secular pressures of the leading culture of Germany — Leitkultur —have left Muslims in the country feeling insecure and unwelcome. It has fractured the Muslim community based on how tightly some Muslims held onto their religion while others let their beliefs weaken with assimilation. While Andreas Goldberg urges that the “future need not be bleak” (48), recent crises with terrorism and refugees have only created more tensions for Muslims adjusting to life in Europe. There is an interesting dichotomy between the seriousness of the refugee crisis and the playfulness of comic-book story-telling. In certain situations, I think it can be a really bad idea to try to “lighten the mood” with an issue that has caused so much harm and so much tragedy, but I think Foreign Affairs The Dispossessed is the exception. The refugee crisis has been a terrible drama persisting for months and stemming out of issues that have been going on for years. We’ve seen horrible things, the Syrian boy face down in the sand — that represent just a glimpse of the struggles refugees have been enduring. But I think most of us, at least I know I do, still don’t truly understand what these refugees are going through. By taking us on a comic-book journey, you get that insider perspective. You get the full experience from start to finish, instead of trying to piece the storylines from various articles together. You get characters that you get to know and connect to, and you hear dialogue and see drawings that sound and look remarkably familiar — though the journey they’re on is something you could hardly imagine. In that way, I believe this comic book, which was only part of the holistic article compiled by various Foreign Affairs writers, was effective in taking us on that journey and teaching us the multiple obstacles and life-threatening setbacks that accompany it. I thought it strategically used Islam, referencing “haram,” but also strategically left it out. I think most people associate Syrians and refugees with Islam already, and that is one of the hardest things to relate to. By not focusing on the role of religion and even having the dialogue say “Thank God” and “God, save us” — opposed to Allah — the writers were purposely trying to evoke emotional empathy from the Western side, which would be their intended audience. And it’s effective, because we hear politicians say things about this religion and we distance ourselves from it, but then we read a story — a comic book, no less — with characters we know must be Muslims, but we feel connected to them, and we care. And that’s good journalism. That’s good storytelling. In her introduction to Islam in Europe, Nilüfer Göle discusses the new permeability of the borders of the world. The word “unsettled” describes this perfectly because people are unsure of how exactly to react to this phenomenon. One of the main reactions to this new instability and uncertainty is, understandably, fear. Göle talks about the visibility of signs of Islam and how that contributes to Islamiphobia in the West – namely, mosques and Muslim women’s head coverings. As Islam has made its way into the West, these visible signs have made it difficult for Muslims to integrate into multicultural and multireligious communities. The “remapping of the world” that Göle refers to means that the West is no longer secure in its position as the “elite” societies of the world. It also means that the traditional centers of the Islamic world no longer have the same significance they once did. Muslims who have grown up in the West are contributing their thoughts to the future of Islam and influencing the place of Islam in the modern world. France has an extremely strict policy of separation of church and state. For this reason the public visibility of religious signs of Islam, such as burkas, have posed obstacles to Muslims in France. There has been resistance to the increasing visibility of Islam in France. Muslims have encountered this resistance in their attempt to build mosques, to wear the clothing their religion dictates and in their practice of praying five times a day. Because these practices are so visible, it is easy for non-Muslim French people to single out Muslims and discriminate against them. This obviously has had a negative effect on the Muslim community in France. Muslims are more likely to be employed in unskilled and low-paying jobs and are less likely than other demographics to graduate from high school. Muslim-owned businesses such as restaurants are not considered a developed sector of the French economy as they are in other European countries. Because of this deeply rooted discrimination, many Muslims are at a disadvantage from the time they are very young. The persistence of Muslims in the lowest sectors of society attests to the negative effects that discrimination has on French Muslims, discrimination that is made all the more easy by the visibility of signs of Islam. There are many obstacles for the integration of Muslims in Europe. First of all, even the term “integration” is troublesome. What does it mean? Does it mean Muslims identify with their European home first and their religion second? Does it mean Muslims accept European practices and beliefs? Or does it simply mean they are accepted and welcomed as a diverse part of European society? Defining the answers to these questions is an obstacle in itself because it means we are unsure about where to draw the line of whether someone is truly “integrated” into a society or not. These questions lead us to another obstacle which is that many Muslim immigrants are unsure how to retain their identity as Muslims while also creating an identity as Europeans. While they want to feel accepted into European society, they don’t want to be forced to give up their beliefs and practices in return. Many Muslim parents face this challenge when deciding where to send their children to school. A lot of pre-schools and day care centers are run by churches or other Christian organizations, and Muslim parents are understandably hesitant to send their children to schools that operate with an entirely different belief system than Islam. 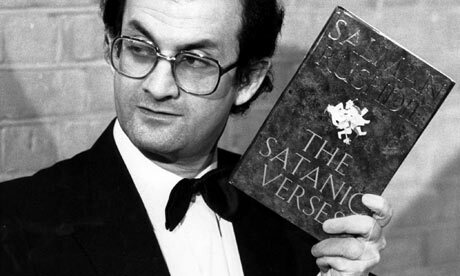 Salman Rushdie with his novel, The Satanic Verses. Salman Rushdie is a British Indian novelist and essayist. His novel, The Satanic Verses, shocked Muslims around the world when it was published. It was especially stinging to British Muslims because Rushdie was a highly regarded English novelist. Muslims felt that the book’s portrayal of their beliefs, their faith and its origin was an insult to their religion and made a mockery of them. The response to The Satanic Verses by Muslims around the world was to try to ban the book and many protested and rioted publicly against it. The then Supreme Leader of Iran, Ayatullah Rouhullah Khomeini, even called for Rushdie to be killed. However, many Muslims did not completely support this extreme viewpoint. Muslims who were strong believers in free speech especially condemned the call to kill Rushdie – while they too were extremely offended by his novel, they believed in his right to publish whatever he wanted to say. The significance of this novel and the controversy it caused obviously shows how strongly Muslims feel about their faith and how important it is to them. But I also think it’s notable that Hunter writes British Muslims were “shocked” when the book was published. I think maybe it shows that up until this point, British Muslims were beginning to feel more a part of British society. To have something so offensive to their beliefs coming from someone they perceived in a way to be “one of their own” would have certainly shocked their community. In Islam: Europe’s Second Religion, Shireen Hunter writes that there is “very little in the way of way of assimilation of the Muslim community.” Hunter goes on to say this means Muslims are reluctant to accept British beliefs, practices and forms of worship. By “British” I suppose Hunter means Christian, although he doesn’t elaborate beyond that. I would hesitate to categorize all of Britain into two categories of Christian/British and Muslim however. Although I’m sure that’s not exactly what Hunter meant by the term I feel like this is part of the problem. One limit to Muslim assimilation into the U.K. is the feeling of being “outsiders” from the rest of the country. Categorizing Muslims as different from everyone else in the U.K. isn’t the way to make someone feel accepted and welcomed into a country. However, after going through the readings for this week I also don’t feel that assimilation is necessarily the goal for many British Muslims. While they want to feel accepted into British society, they want to be accepted for their beliefs, not in spite of them. The influence of Western experiences on Muslims has been contradictory in that they have produced both more modernist viewpoints and more conservative viewpoints. Two Islamic groups in Malaysia – the ABIM and the PAS – are representative of these contradictions. PAS was far more conservative and traditional and had an inflexible interpretation of Islam on everything from women to non-Muslims. In contrast, ABIM had a modern viewpoint that was more moderate and urban-based than PAS. Its vision of an Islamic state “emphasized democracy, pluralism and social justice” to speak to the realities of multireligious and multiethnic societies. While ABIM’s vision seems to fit better in the reality of the world now, many Muslims were attracted to the militant strength of PAS and the force of their beliefs. This dichotomy between the two groups can be applied to Muslims worldwide. There are Muslims who are more attracted to anti-Western rhetoric and the belief in an all-encompassing Islamic state and there are also Muslims who are trying to figure out how their beliefs and practices fit in a world where there are many different systems of belief trying to peacefully coexist. Post 10: Muslims in the U.K.
Salaman Rushdie is a British author from India who received many death threats and controversy after publishing Satanic Verses in 1988. The book was his fourth novel. The title was inspired by verses to pagan goddesses and was part of the story. Although the book got positive reviews in Britain, it caused uproar among people of Muslim faith. The supreme leader of Iran at the time was calling for Rushdie’s death. The reason that so many Muslims took offense to his novel was because one of the dream sequences he used was a re-telling of the life of Muhammad. He places doubt on the fact that he was the messenger. Many Muslims in the U.K. were holding demonstrations, as they were told by the Supreme Leader of Iraq to kill Rushdie. The Conservative leader of Britain at the time, Margaret Thatcher, was giving Rushdie full protection. Many British modernist Muslims supported Rushdie’s right to have written the book. In 1991 it proved hard to estimate how many Muslims were living and moving to Britain because the census had no question about religious affiliation. Instead, Muhammad Anwar estimated this number by using the birth country and the answers to ethnic identity to estimate there were approximately 840,000 Muslims in Britain in 1991. Most of the British Muslims are Sunni. Britain’s Muslims are characterized in two different divisions: the traditional vs. militant Islam and the traditionalist vs. modernist. Modernist Islam essentially chooses to only associate with the parts of Islam that are seen as acceptable to the Western cultures. As far as assimilation goes, poorer citizens may not assimilate at all, they see their mosque-based authorities as more important than British government or officers. Islam population around the world. Muslims represent a wide range of a varied religion, from reformist to militant conservatism or fundamentalism, Malaysian Muslims have been known to represent this phenomenon. The varied takes on Muslim is the controversy. The Islamic Youth Movement of Malaysia and the members of Malaysia’s Pan-Islamic Party had similar goals “such as the creation of a social order and denunciation of Westernization, secularism, materialism and political authoritarianism. PAS was much more conservative and would label some as unbelievers. PAS thought non-Muslims had nothing to fear from Islamic State. Students who had gone and studied in Europe became influenced by PAS and returned to take up conservative Islam. In contrast to PAS, ABIM wished to create an Islamic State that was influenced by democracy, pluralism and social justice. Throughout history, cultural discrepancies between Eastern and Western ways of life have clashed for a variety of reasons. In Europe we are seeing an influx of refugees and migrants fleeing conflict in their home nations for a more promising life in Europe. The cultural differences are being exasperated by the sheer numbers of individuals migrating to Europe recently. This has become a more pressing concern in recent months as European nations are scrambling to deal with the issue. The recent humanitarian crisis in the middle east has magnified the differences in culture. As European countries attempt to maintain their identity, the migrants arriving to Europe face an uphill battle to assimilation in their new homeland. One of the biggest challenges to overcome in this issue is the Western media’s biased portrayal of Islam and the situation at hand. “The idea that the tranquility of Western civilization is threatened is not merely a fiction but a widely shared opinion in real-life politics,” (Gole 4). The media is largely responsible for perpetuating these biases in reporting on the current events. Islam is commonly misunderstood in Western civilizations and many connect it with terrorist activities because of a lack of understanding or education. This issue has undoubtedly caused introversion amongst Islamic identifying individuals and adds another dimension to the assimilation process. Often the words ‘mosque’ or ‘hijab’ evoke feelings of irrational fear in Western civilizations. People’s feeling that Islam is invading their homeland and the fear of losing their “home” has sparked much of the controversy evident in today’s politics. Gole did an excellent point of highlighting this issue in discussing what is going on in Switzerland. The government there and in other European nations such as France has openly discussed propositions which would alter the ability of traditional mosques to operate. (The countries want to separate the mosque from the minaret). These ideas fundamentally execute the freedom of identity and religion every individual should be guaranteed and only further the divide between cultures. In the U.S. and Europe these preconceived stereotypes present themselves in a number of cultural, political and social manifestations that complicate assimilation. These misunderstandings and reactionary thinking are some of biggest problems facing Muslims in Europe today. “The public sphere is in danger of losing its role as the ideal expression of democracy and of common sense, and of becoming the site of sacralization of public opinion and of the contagion of the sensational and scandalous,” (Gole 12). Islam is not just a religion for many of these individuals but rather an everyday facet of life. Another challenge Muslims face in Europe is the fear that they will lose their own identity and culture in their new homeland. Most individuals arriving here want to integrate but fear Western culture will reject their way of life. For naturalized Muslims this process is somewhat easier as cultural norms are ingrained in their everyday lives. This brings me to question, to what extent should these individuals conform to Western society? Islam will continue to have a tremendous effect on Western civilizations moving forward. As Muslim populations continue to rise these issues will be even more magnified. Will European nations continue to focus on the differences and threats to their identity? Or will the future hold a more assimilated and inclusive world? It will be interesting to see how this situation plays itself out in the Western world over the next 10-20 years. The Islam population in Germany is estimated to be between 2.8 and 3 million people as of Hunter’s writing of Islam, Europe’s Second Religion. Although there is no concern with Muslim religious interests, there has been unease with the formation of Islamic organizations. Overall, very few Muslims in Germany are extremists, but there is lots of tension. The issue of family reunification marked the beginning of Germany’s history as an “immigrant-receiving society.” The economy was greatly impacted, with many more inactive and dependent immigrants. Germany had to face developing new policies to adapt to having an immigrant culture. One major difference was that many Muslim families did not wish to send their children to schools because most were run by churches. In the early 1980s, about 250,000 people who were mostly Turks left the country, as immigrants were offered financial incentives to return to their native country. This led to pension schemes. The public’s knowledge of the law came through sensationalist newspapers and created a dissatisfied taste in the public’s mouths — hostility increased. There are approximately 2.4 million Turkish Muslims in Germany, which means that the total number of Muslims in Germany is closer to 3.3 million. Bosnians have the next highest Muslim population in Germany. Integration into German society goes hand-in-hand with accepting Germany’s Christian society. The future of the Muslim community has large weight on the education system. Despite an increase in Muslims receiving more education, the school dropouts are higher in Muslim populations. Although currently only one third of the Turks in Germany are employed somehow, they contribute to 2 percent of the total GDP in Germany. I think that if Muslims were more welcome to pray during daily activities they may have been able to help add more to the nation’s GDP. During the first-wave of immigrants, many Turks requested places of prayer in hostels and factories. In the 1990s there have been attacks on Turkish Muslims, and despite their being there for a while, there has been lots of hostility toward Turkish Muslims, despite law changes and citizenship gained. Currently, the way that German media reports on conflict in Islamic country only inflates the hate between Muslims and non-Muslims in Germany. The comic, “Dispossessed,” that ran in Foreign Affairs. Does not necessarily do the Syrian refugee crisis justice. When I read this comic I thought it was effective for the mainstream American audience because it made the situation more relatable for most. I instantly wondered how often this situation was the reality though; so many families did not successfully leave. I think that the crisis does not let Islam play a normal role. Lots of the families are Muslim, but many are Christian as well. I think that when it comes to a situation like this, the religion is not important, it’s just the idea that we need to help people. “We are living in a world in which difference, whether linguistic, religious, racial or cultural, is not contained within national boundaries or regulated by state power alone, but instead becomes mobile and crosses boundaries. However, entering into close relations with other people and cultures is not always a desired experience; often it produces resentment and a fear of losing one’s sense of identity, of feeling safe and ‘at home'” (Göle 1). In the Introduction to Islam in Europe by Nilüfer Göle, she describes the changing world as more cultures intersect and intertwine, to some detriment. While it is easier to feel comfortable surrounded by people who look and think like you, this new dynamic is inevitable. And with that, comes an uncertain level of instability: “A remapping of the world is underway; the hierarchies of different parts of the world – the supremacy of the first world, and the dependence of the third world – are unsettled” (Göle 3). By this, Göle is referring to a culture clash, actually she cites Samuel P. Huntington’s idea of a “clash of civilizations,” where an increasingly globalized world will cause significant tension between formerly isolated nations. Especially those with a superiority complex. “The porousness of borders and boundaries risks shattering the privileges of modern Western citizens hermetically sealed off from unwanted customs, cultural differences, and uncivilized behavior, living in secure gated communities and in nations with boundaries under surveillance” (4). The ice cube container-style of international relations is rapidly melting away, pun intended, and that’s just something we are going to have to get used to. As hierarchies are challenged and even overthrown, a new world society will emerge, because the current state of anarchy, just won’t cut it. Islam has a major presence in France, as partly a consequence of France’s imperialistic history in the Muslim world. However, this public visibility doesn’t necessarily make it easier to be treated equally. In many ways, it creates more obstacles. For instance, Muslims are often stereotyped by the small percentage of Islamic extremism that exists, a view that is exacerbated every time a terrorist attack like last year’s attack against Charlie Hebdo occurs. This Islamophobia can actually drive more Muslims into extremism, especially the youth, Remy Leveau and Shireen T. Hunter point out in the first chapter of Islam, Europe’s Second Religion. Leveau and Hunter have hopes for the nation, however. They believe integration for Muslims can happen without assimilation. Particularly in France, they see the “trend is to develop new interpretations of Islam and new syntheses of Islamic and French values that would enable the new generation to live as French and as Muslim” (26).